The Green Premium in NYC Rental Market Heads Towards Zero | The Notorious R.O.B. A really fun discussion on Twitter with Robin Greenbaum (@cobrokenation) led me to just do a very quick, very back-of-napkin, and likely very inaccurate comparison between two rental units. As Robin pointed out, since comparisons are very difficult, depends on many factors, and the like, no matter what I come up with, this is likely to be wrong. Nonetheless, I’m curious to see if we might see any interesting bits of data. 725 sq. ft., monthly rent of $2,880, 23rd floor but facing east (aka, no river views). I know the floorplan is hard as heck to see, but it’s pretty standard fare for NYC apartments. The second unit is located at The Verdesian, a LEED Platinum certified building located right by 22 River Place. See the map here. The Verdesian is a newer building, built in 2006, and LEED Platinum is not given to just about anybody with a solar panel or two. There was quite a lot of thought and technology devoted to the building. 750 sq. ft, $3,065 per month, and east-facing on the 13th floor. Clearly, the little alcovey “Den” area means a smaller living room, but the floorplan might be better for some, worse for others. Who can say? On a straight $$/sq.ft. basis, however, the difference is only $0.12 between the newer, eco-friendly unit and the older, non-green unit: $3.97/sq. 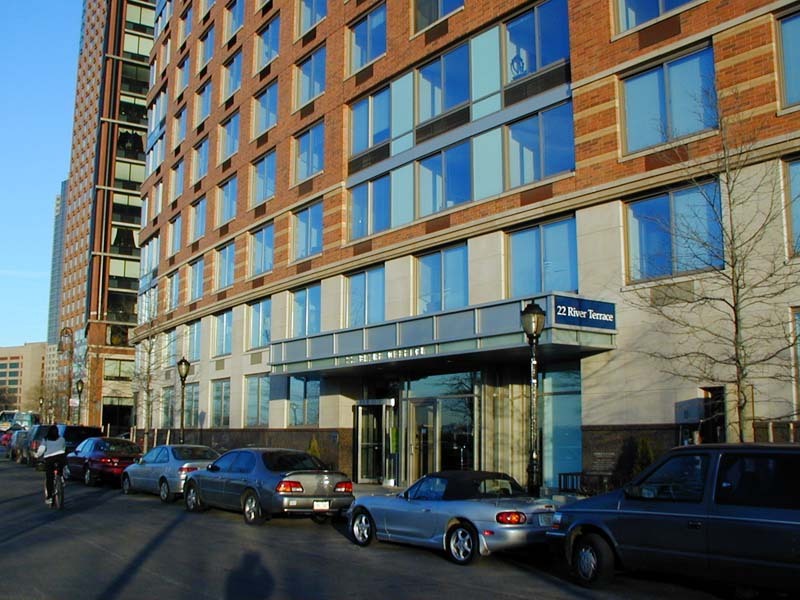 ft. for 22 River Terrace vs. $4.09/sq. ft. for The Verdesian. If we hold the square footage equal at 725, that means a monthly rental difference of $87.00. To my untrained, unpracticed, and non-realtor eyes, this seems rather insignificant and would tilt the decision towards the Verdesian. 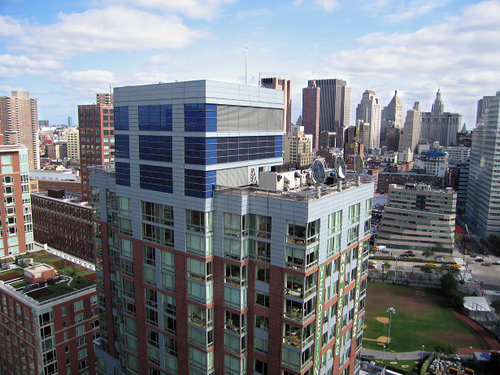 According to GreenbuildingsNYC.com, the Verdesian’s advanced systems, EnergyStar appliances, and various other design & architectural choices, means a 40% savings on electric bills for residents. According to ConEdison, the average NYC resident can expect to pay $104.97 per month in electric bills. A 40% savings on electricity alone is $41.99 per month. Nearly half of the “green premium” (if that’s what it is) is taken care of simply from savings in electric bills. Now add in the fact that The Verdesian is five years newer, and offers “Fresh filtered air, continuously humidified or dehumidified, depending on climate conditions” to every unit, and it isn’t clear to me that the green premium starts to head towards zero. Again, comparing different units, different buildings, with slightly different amenities and the like is hazarding error. But it does seem significant to me that the actual cost difference may be as low as $45 or so per month — less than the cost of a cup of Starbucks latte per day. If this is true, then the green premium at least in the NYC rental market is heading towards zero, and renters really have to ask why they would go to a non-green building vs. a green building. I for one would love to see some real comparisons by real professionals — realtors, appraisers, I summon thee! PS: Note that I am a heretic when it comes to anthropogenic global warming hype, so this has nothing to do with religious views on carbon footprints and such nonsense. So, is this aspirational? Seems more practical. What about adding “practical” to your aspirational-thrift marketing continuum? Well, the thing is, if you look at the green buildings generally, they are high-end luxury properties for the most part. Sure, some offer “lower income” units, because that’s how they got public financing, etc. but the units are definitely aspirational. Look at the website for The Verdesian, for example. I like this short pithy post. Something to take into consideration is the fact that the cost of building a “green” building have come down greatly relative to the cost of building a standard building. As LEED certified buildings become commonplace in NYC, the technology and no-how to build such buildings become more readily available. Furthermore, the competition in the market has put downward pressure on the cost of materials. I’m a big proponent for green development (studying for my LEED AP certification) and believe that in the not-so-distant future reaching at least some standard of LEED certification will become a requirement. I recently heard Russell Albanese of the Albanese Organization (developer of the Verdesian amongst other green buildings) speak. They developed the Solaire in Battery City Park which was one of America’s first environmentally advanced residential towers. They’re currently working on the Visionaire. Russell spoke about how he learned what worked and didn’t work from his prior development. This made his most recent development much easier. I think this is the case across the market. Although green buildings are no longer demanding premium rents, green development will no doubt continue to thrive.